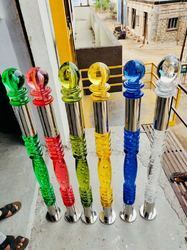 Our organization is vastly engaged in manufacturing and supplying a wide gamut of Acrylic Railing in Rajkot, Gujarat, India. It is designed and made out of finest quality material and with the aid of sophisticated technology under the strict supervision of skilled professionals. It is obtainable at most competitive rates. Buyers for Acrylic Handrail can contact us.